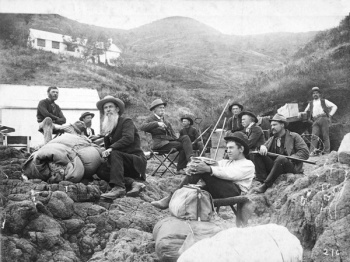 Camping Party, Middle Anacapa Island,1889. 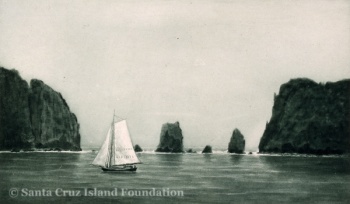 In August 1889, a group of artists and members of the Santa Barbara Natural History Society chartered Ezekiel Elliott's sloop, Brisk, for a 10-day cruise to Anacapa Island. The party included photographer Isaac Newton Cook (long beard) and his assistant, Harry Jenkins (far right), naturalist Lorenzo Yates (third from right), and Yates's good friend and noted artist Henry Chapman Ford (center, sitting in a chair). » Ford, Henry Chapman Lyonothamnus asplenifolius in Bulletin of the Santa Barbara Society of Natural History 1:2 (56-58) 1890. 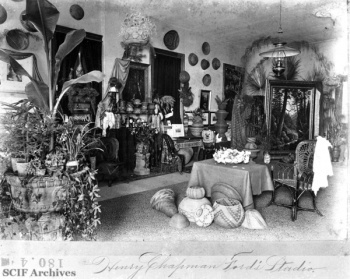 June-Sept. 1878 Ford was in Yosemite with Mary Stevens Fish (1842-1895). June 15, 1887 [SBDI]: “Mr. 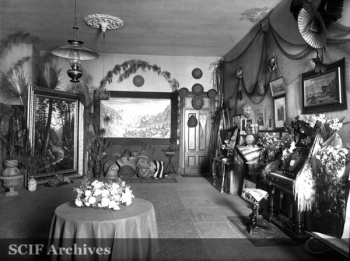 H. C. Ford, the artist, will hold a reception at his studio in the Odd Fellows’ building tomorrow (Thursday) afternoon. He will have on hand water color studies made on his recent trip to Santa Cruz Island and the San Rafael mountains, showing the novel, striking and interesting features of those localities. This page was last edited on 7 April 2018, at 12:03.